“We will ensure that it would not portray Islam as a cruel and inconsiderate religion. That is not what Islam is,” Mahathir was quoted as saying by Malay Mail. 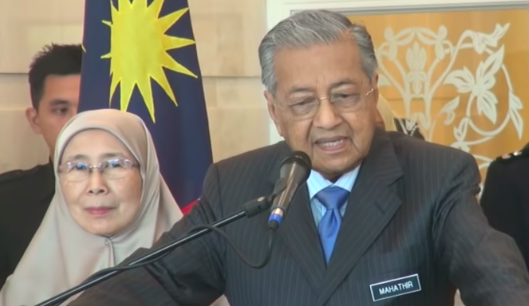 Mahathir said that there have been instances where Muslims impose certain non-Islamic rulings that portray Islam as a religion that has extremely strict practices. “We like to impose religion, when the Quran has said, ‘There is no compulsion in Islam’,” he added. But for some reason he won’t tell you that this verse has been abrogated by the verse of the sword. You are a knowingly deceitful Liar !!! Liar, Liar pants on fire !!! islam is a crime against humanity !!! islam is a criminal crime gang !!! islams are criminals – each and every one of you !!! … So I guess that is what you are islam criminal Malaysian Prime Minister Mahathir Mohamad (even your name is a crime and your very existence is a crime against humanity)!!! … a knowingly deceitful and acutely cowardly islam criminal !!! When he was last Prime Minister he banned Israeli’s from entering Malaysia.